So sure was I that the attribution to the Chinese was accurate, that I went to Wikipedia hoping to find out why anyone would think it a curse to live in interesting times. We certainly do and I, at least, don’t feel the least bit cursed by the swirl of events that engage me. There’s your global warming, and your energy dependency issues, and your financial meltdown, and I could go on but you know what I mean. What I find most interesting, though, is the way masses of people are responding to the times. May the naysayers and apostles of negativity be consigned to the dustbin of history. It’s those who are actively, progressively addressing the problems that confront the world that attract my attention and spark my imagination. the destabilizing global economy through bad fiscal practices and debt; the likelihood that oil prices will again soar as supplies exceed demand and concerns that global warming cannot be stopped by technology alone — because climate change is happening more rapidly than was forecast. Clarke called this threat ”the long emergency — where the world that we have known is going to shift dramatically,” the Recorder said. Clarke said one way to meet the emergency is the creation of “transition towns,” an idea that began in England in 2007. 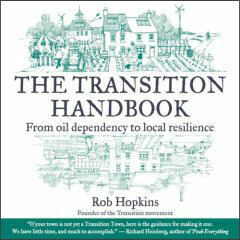 There the visionary Rob Hopkins, who has since published The Transition Handbook, was instrumental in leading his home town of Totnes to become more self-reliant – Hopkins uses the word “resilient” – and less energy dependent. Community and collaboration are essential to the transition town movement. The restructuring of attitudes and practices is key. In the book, and on one of many transition web sites, Hopkins sets out a series of 12 key steps to becoming a transition town. This is no starry-eyed feel-good project. There are criteria, benchmarks, goals, and the availability of training to lead one’s community in the transition. There is a free primer for those who want to know more before they get involved. Recognition of the present situation begins with the understanding that Peak Oil and global warming will inevitably change the way we all live. Peak Oil refers to the indisputable fact that petroleum is not an infinite resource and that at some point, if it hasn’t happened already, the maximum rate of petroleum extraction will be reached, after which the availability of oil will decline until there is no more. 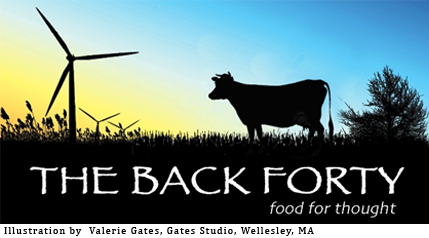 Clarke, who is a Transition Town trainer, said that in Totnes local food production has increased by 7 percent in just one year, by the simple expedient of putting people who owned land and didn’t want to farm in touch with those who wanted to farm and didn’t have land. Both groups now have more wholesome food on their tables. The movement isn’t confined to the UK, by any means. The US Transition Town site lists five weekend training scheduled for the last two weekends in April alone. Clarke said there are 152 transition towns around the world, with some 900 others in earlier stages of formation. Among US cities you may have heard of that have transition town groups operating are Austin, Texas, Portland, Maine, and Tucson, Arizona. In many ways, people in rural towns may be better able than city folk to put a transition program together. We tend to know each other better, to have borne adversity together in a more profound way. We have the land to farm. We have the economic need to save energy. Those whom rural life hasn’t already made pretty darn resilient have probably moved out. Weather, hence global warming, is more of a factor in our lives than it would be if we lived in the city. I’m hoping you’ll be inspired to track down Transition Town information on your own. The places to start are the UK site and the US site. Among ideas that surfaced at last week’s meeting was a class in canning and storing homegrown produce. ”It’s one thing to grow your food and another thing to eat it in the winter,” said a local gardener and food columnist. The Buckland group will meet again on April 28. I’m thinking — hoping — that these interesting times we live in will make us stronger, more emotionally and spiritually mature, and will bring us closer together.